Fraleigh and Beauregard's text is known for its clear presentation and writing style, mathematical appropriateness, and overall usability. Its inclusion of calculus-related examples, true/false problems, section summaries, integrated applications, and coverage of Cn make it a superb text for the sophomore or junior-level linear algebra course. 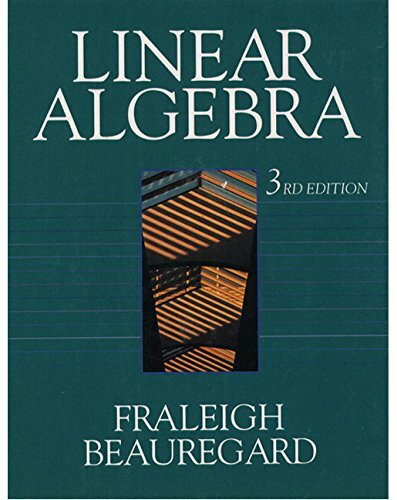 This Third Edition retains the features that have made it successful over the years, while addressing recent developments of how linear algebra is taught and learned. Key concepts are presented early on, with an emphasis on geometry. MARKET: For all readers interested in linear algebra. About: Fraleigh and Beauregard's text is known for its clear presentation and writing style, mathematical appropriateness, and overall usability. About: Contains the complete solutions, including proofs, for every third problem in each exercise set.